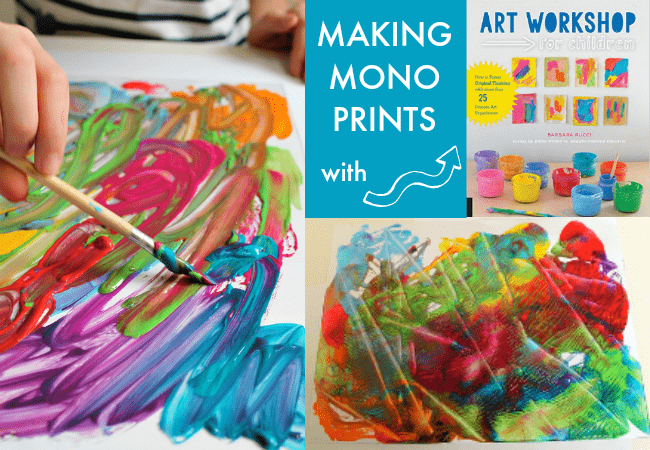 Here’s a gorgeously easy monoprint project for children from Barbara Rucci’s super new book Art Workshop for Children. 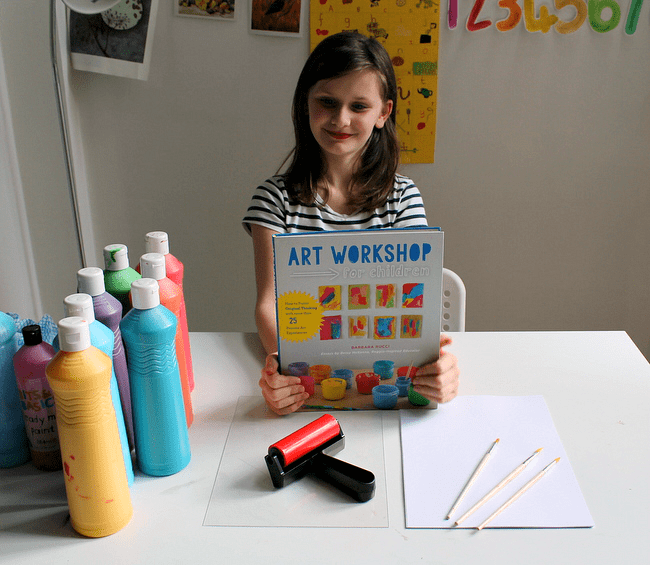 My friend Barbara Rucci, who many of you will know from her Art Bar blog, has a wonderful new book out called Art Workshop for Children. It is a delight, and I am very pleased to be able to share a project from the book with you, as part of Barbara’s book launch blog tour. The book brings you 25 process art experiences to try, including tips on how to get started, introduce new materials and techniques, and lots of ideas for individual and collaborative projects. 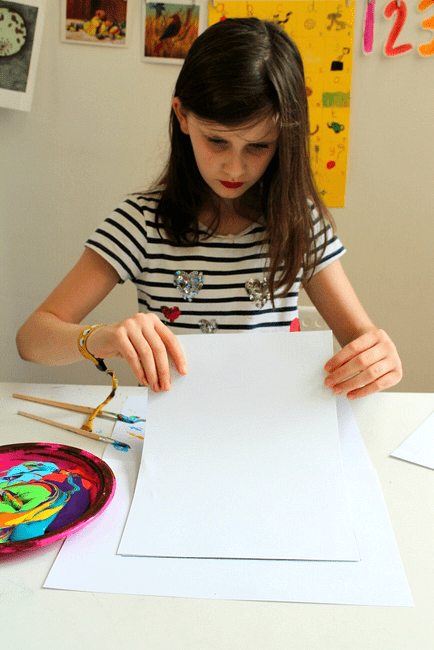 Barbara has a background in graphic design, and runs children’s art workshops from her home, making her the perfect guide to creative art processes that you can try with your own children. She has that magical combination of wow-factor inspiration and practical, smart guidance. 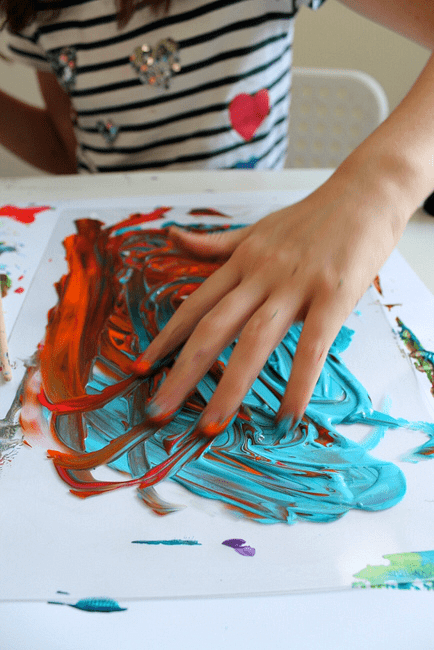 In Art Workshop for Children, she’s paired up with Betsy McKenna, a Reggio-inspired educator, and Betsy has added thoughtful and thought-provoking essays full of wisdom on how we can support and inspire our children’s creative explorations. 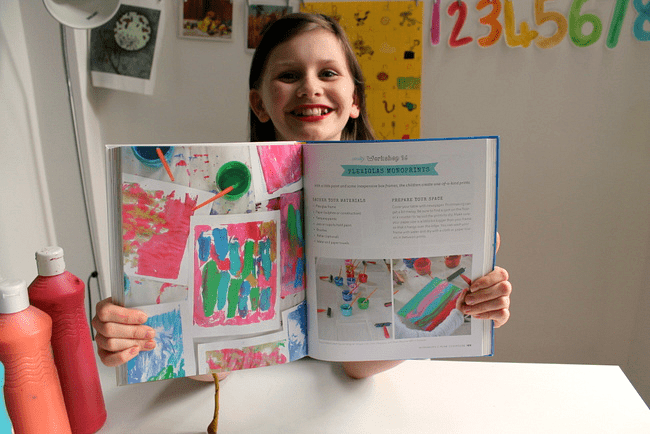 You can get Art Workshop for Children, published by Quarry, from Amazon. For a taster of what’s in the book, here’s one of Barbara’s projects that my daughter picked out from the book: a simple monoprint project. 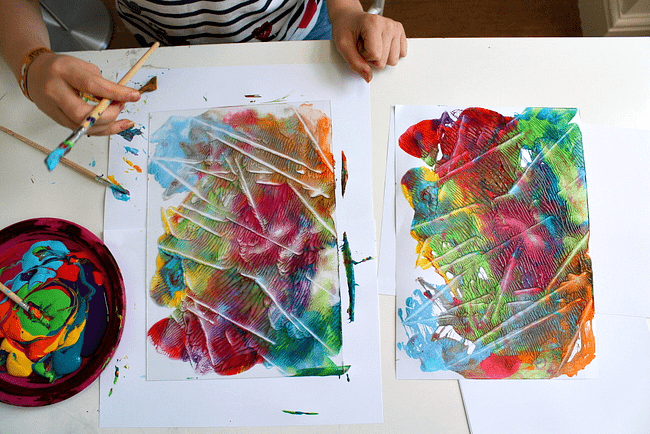 This is Workshop 16 from Art Workshop for Children: Plexiglass Monoprints. All the projects give you a materials list and a step by step guide on how to try them out, along with gorgeous photos. You’ll find lots of variation and extension ideas too. 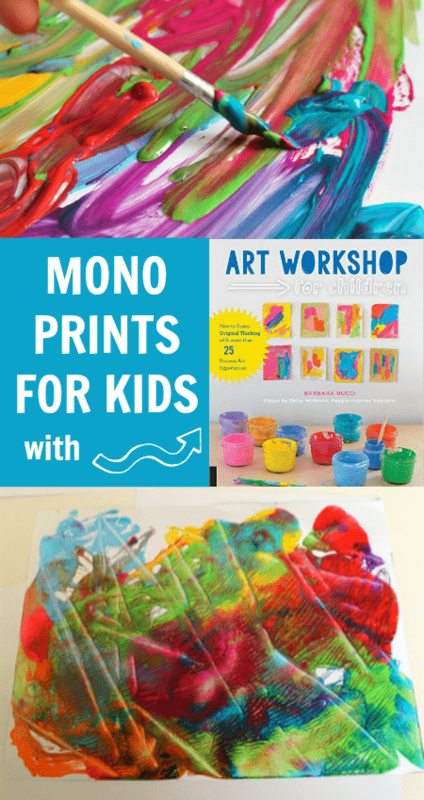 To make monoprints you start by making paint patterns on a piece of flexiglass. We used a plastic ‘glass’ from an Ikea picture frame. My daughter picked out her favourite paint colours, and really loved playing with the paints. 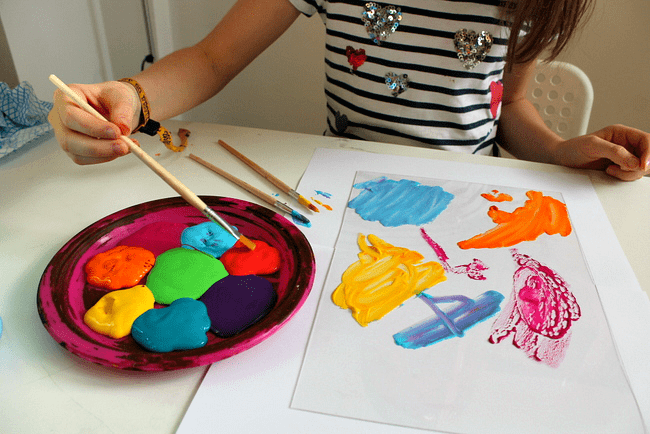 You can brushes, or fingers, and even squirt the paint straight on to the plexiglass – fun! It’s a really sensory process. Then, carefully place a piece of paper over your paint. We actually used a piece of card here for a bit of a stronger surface, given my daughter’s abundant use of paint! 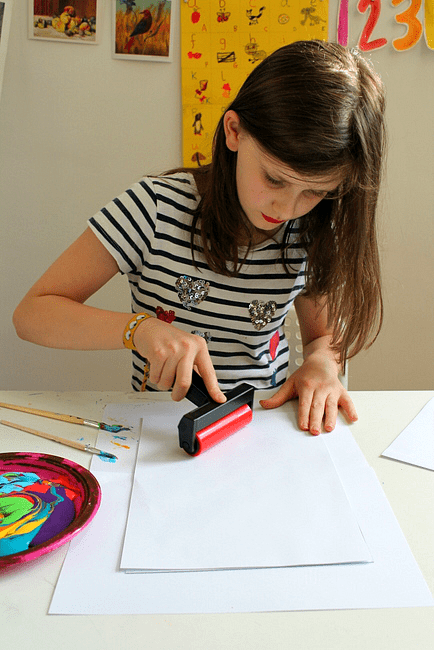 You can use a roller, or your hands, to press down on the paper. My daughter loved how the paint felt under the paper, and that a bit of the paint squished out of the side. Finally, carefully peel back your paper to reveal your monoprint. A monoprint is a one-of-a-kind print. Every single print you take with this process is unique. You can place a second piece of paper onto the painted surface to take a second print and compare how it is different to the first. 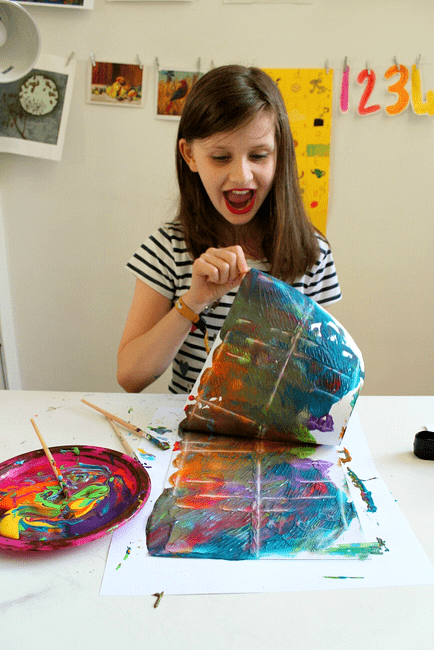 The paint is also really easy to wipe or wash off, so you can enjoy all the sensory delights of adding more paints and creating a whole series of monoprints. Art Workshop for Children by Barbara Rucci, with Betsy McKenna, is available from Amazon. It’s an inspiring and practical resource for parents and teachers, and would make a wonderful Christmas gift for all creative kids. Disclosure: Barbara is my friend and she sent me a free copy of her book to review as part of her book launch blog tour. It’s delightful and I recommend it to you!